After all the 'seriousness' of the first YouTube videos, I figured I'd let down my hair a little (my hair is most certainly up in the video, but don't let that fool you)! 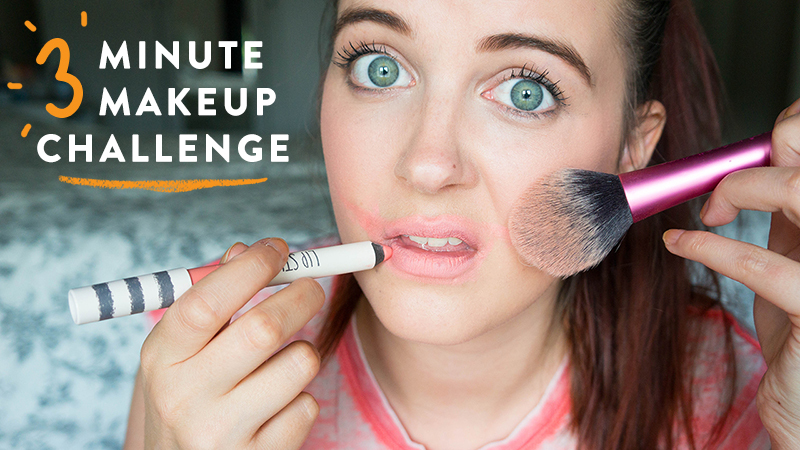 I had a go at the 3 Minute Makeup Challenge and had loads of fun in the process. One makeup stained carpet and near deletion of the footage later, it's ready. I hope you enjoy! Thank you Maddy, you are such a doll. Adrienne, you have amazing skin! This was hilarious to watch and you did a good job. I would not be able to do it haha. You think? My skin is so dry, but I'm trying out a new regime that seems to be working for me. :) Thanks lovely! I highly recommend it, I use it for pretty much everything! I actually buffed some concealer into my mums skin today with it and she's converted too. I love the picture, it's so funny :) Great job on the video. Since it's been talked about somewhat, you really do look fantastic with or without it. Obviously no one has pink lips irl, but other than that, it seems like makeup is more of an enhancement rather than concealment, for you. It's really sweet of you to say. The camera is very forgiving though, I think. Oh, and the title image is hilarious. I love that you can just do stuff like that, and have fun with it all. Heh, I couldn't resist doing a silly thumbnail for it! Adrienne, would you post the makeup you used in this video! That foundation looks absolutely flawless!!! You look stunning, love! Go for it Daphne, I would love to see your version! ahaha i loved this, you're so adorable!! Haha, aww, this was good! haha good effort! So funny and I know what you mean about cat hairs! Ahw, Amy, thanks my love. ♥ I swear, they get everywhere! No matter how much I vacuum they always happen to be on my brushes. It's like Derek deliberately sits on them to annoy me! Sat laughing at this at work, not subtle in the slightest! New follower, keep up the good work!